I used MAC Rich, Dark, Delicious as a base for the cookie nails, mixed with American Apparel California Trooper to make the design/highlight, and mixed MAC Rich, Dark, Delicious with American Apparel Hassid to shade. On the ring finger, I used Essie Bone Chilling White as a base, with the same colors as above for the cookie parts. For the logo nail, I used ALDO Sea You in Ibiza as a base, with Sally Hansen Professional Lavender Cloud for the logo, and China Glaze Flyin' High for the teal outline. Topped it all off with 2 coats of Seche Vite top coat. I've been following your blog for a while now and I am always excited to see your new design for the day. I just wanted to take the time to say that I LOVE this design very much. I am also an Oreo lover (the regular kind, of course! none of this double stuff nonsense). And now you've made me crave them! Which I don't mind, no, not at all. Oreo's are ok (I feel ya on the double stuffs) but always liked Hydrox cookies better. I don't think they make them anymore. Joe joe's are my new fav! I'm not an avid fan of the double stuffed OREOs either. Too much cream filling thingy. Regular OREOs, on the other hand, are a-okay in my book! Nice manicure! I'm always amazed by your attention to details. Your nail designs continue to amaze me! Even if I disagree w/ your thoughts regarding double stuf oreos :) The new cakesters are the best, though. I don't like oreos at all, I can't stand the black cookie crumbs that remain all over my teeth, but I'm tempted to change all that- your nails are absolutely gorgeous!!!!!!! Omg this is soooo prettyy !! Watch this video, im a new starter on youtube and i looove make up and fashion! Please watch comment and subscribe. OMG, Oreos are one of my weaknesses. Seriously, once I start, I just can't seem to stop. It's gotten to the point that I don't even bring them into the house anymore! Now I wanna nomnomnom on your nails! Also, since you've brought me so much sunshine, I wanted to pass a little bit back to you. So, I've given you a sunshine award! (It's in my latest post, titled Yay, I got a Sunshine Award!) I hope it brings you a bit of joy... it's only fair, since you've brightened so many of my days! If u dont bite i will haha..
Crazy good detail! And I think it's some kind of Twilight Zone phenomena regarding the Oreo bag that always ends up 1/3 empty right after you open it. The same thing happens to me. So WEIRD! AWESOMEEE!!! I totally with you about the double-stuffed! you make me want to eat oreo's so badly! Oreos always tasted like dirt to me. Oh well, more for you all. Really nice job on the nails. omg so clever , love it!!!!! This is so, so cute! You amaze me! This and the Sock Monkey nails are my favorite by far! My question is: How do you keep the paint from getting lumpy on the nail? When I do designs it's like 3-D, or a topographic map! Is it the polish, the brush, the technique? Any suggestions? GREAT. THANKS A LOT. I just ruined my diet cause i went to the grocery store and I had Oreos on my mind from this post. I heartily agree with you about the double stuffed Oreos. I feel the same about them changing the ration on Reese's Peanut butter cups. Don't mess with the ratio!!!! I meant changing the ratio, not ration- D'oh! 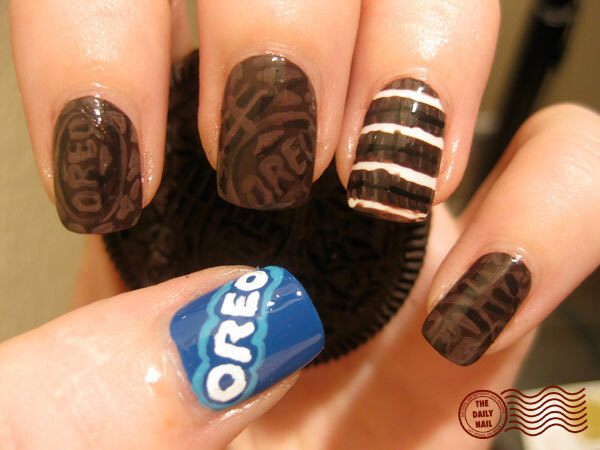 Love oreos and the nails are beautiful! I would love to be out and about and find someone with Oreos on their nails. Haha, you're probably like the only one that does this though. Where do you come up with your ideas?!? They are so fun!